If you’ve ever despaired at your children’s lack of interest in eating fruit and vegetables, why not try growing some with them? Following the whole process from sowing the seed to harvesting the crop, and then cooking it together, can really make children invest in their labours – they’ll want to taste what they’ve spent all that time growing. WoodBlocX raised beds make the whole project so easy for children to enjoy and the chances are they’ll suddenly discover that they do like carrots after all! For those with a short attention span, crops that show a quick return are best. Micro-leaves offer the fastest harvest time, as they are just seedlings and can be grown like cress; (remember the cress ‘hair’ in the eggshell heads you probably made when you were a child?) All sorts of salad crops can be grown this way, or even on a piece of damp kitchen towel, such as lettuce leaves, beetroot and radishes. Full grown radishes also offer a fast turnaround from sowing to harvest, and baby versions of mainstream crops such as carrots and parsnips are harvested sooner, and are often naturally sweeter too. Then it’s time to think about the crops that can be eaten straight from the plant; fruit such as strawberries, raspberries, blueberries and various tree fruits like apples, plums and cherries are all great choices. Peas can be eaten straight from the pod – or eat the whole pod with mangetout (literally ‘eat-all’). When a vegetable is freshly harvested its natural sugars are at their highest level, and peas can be munched like sweets. New potatoes also offer excitement and learning opportunities – planting one potato results in many more, and digging for the harvest is like digging for buried treasure. 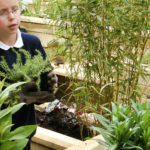 Giving children ownership of their own growing space also means they are more likely to be invested in the outcome. A WoodBlocX raised bed can be a great way to do this – a small contained space, separate from your own flower bed /vegetable beds so there is no chance of precious plants being trodden on. Being raised off the ground also makes it easier for children to reach. If blueberries are a particular favourite, a raised bed is also a great way to introduce the right soil – acidic – for these plants in a neutral or alkaline soil garden. A strawberry plant in each corner - a central sunflower (for use as a support for a climbing bean plant) - a row of baby carrots - a row of peas - a row of first early (new) potatoes that once out, could be replaced with a pumpkin plant for Halloween (though this will probably trail out of the bed a bit as well). Alternatively, by going for a slightly deeper bed – 45cm as a minimum, such as the hexagonal 1.55m x 0.925m bed from WoodBlocX – you could go for the lower maintenance option of a fruit tree surrounded by herbs and flowers. Children love to try the different scents on the leaves; mints are great for this, coming in flavours such as strawberry and chocolate. Pineapple sage is another good option, and nasturtiums are a brilliant seed to sow with children as their seeds are large and easy to handle and germinate relatively quickly and reliably.